If you want to know how flat your newly poured concrete is, consider using laser scanning technology to measure it. Covering much greater areas than yardsticks, we can provide floor flatness and levelness reports, as well as area heat maps, which can be much more descriptive than traditional reports. Using point clouds, our team can extract points to investigate floor features such as flatness and levelness. Our team can use this data in evaluating ASTM 1155 standards for determining Floor Flatness (FF) and Floor Levelness (FL) numbers. Along with these statistics, a heat map is provided that allows for simplified viewing of trouble areas. We can automatically extract detailed point clouds of either floors or the ground for further analysis. 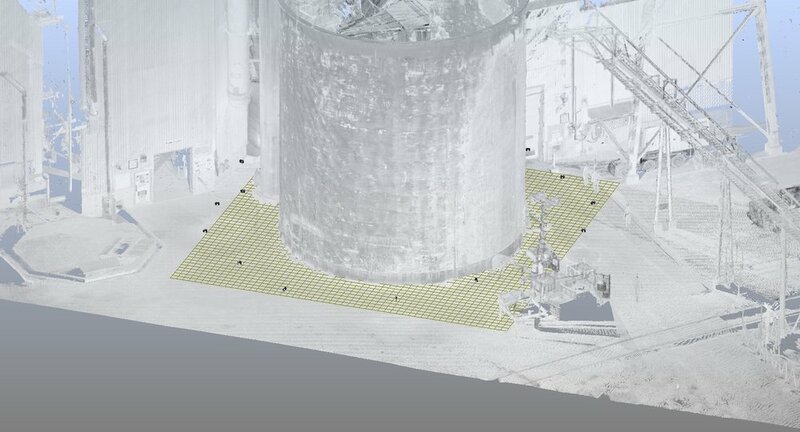 Variance in floor height can be displayed using point cloud data, making it easy to view problem areas. The levelness of a two dimensional surface can be found in relation to another surface, or to gravity. This technique is superior to using a traditional inclinometer, as it collects thousands of points per surface and can be accurate to up to 0.5 degrees.